By the 1970s, the popularity of the American movie musical had declined, although that didn't stop Hollywood from throwing a few curveballs of the genre. Alongside those rare hits more conventionally adapted from Broadway like Jesus Christ Superstar and Grease, one could thrill to the seductive decadence of Bob Fosse's Cabaret, Brian De Palma's midnight movie in the making Phantom of the Paradise, Ken Russell's berserk rock operas Tommy and Lisztomania, or the panoramic, microcosmic spectacle of Robert Altman's Nashville. Toward the decade's end, two of the most daring genre revivals came courtesy of filmmakers hitherto widely lauded for their unvarnished portraits of New York City: Martin Scorsese, with Mean Streets and Taxi Driver, and Sidney Lumet, with Serpico and Dog Day Afternoon. With New York, New York (1977) and The Wiz (1978), Scorsese and Lumet, respectively¡ªmaking the first and only movie musicals of their respective careers¡ªwould use the genre as a lens through which to present lively, fantastical, and critical takes on the city both men called home. Scorsese foregrounds his film's artificiality in an audacious opening shot, which picks Doyle out of a crowded Midtown street parade on VJ Day in 1945. A high crane shot pulls away, and tracks back, following Doyle's movements until we lose him in the bustle. The camera reaches its peak, and Doyle suddenly emerges near the foot of the frame¡ªat the same time a huge, glowing red neon street sign in the shape of an arrow points directly at him. Doyle proceeds to a vast nightclub, where he spots Minnelli's Francine, and proceeds to woo her with a combination of sandpaper abrasion and limpet clinginess. As with Cybill Shepherd's Betsy in Taxi Driver, the girl is tickled by something ineffable in this dusky loner's demeanor. Immediately, this New York is positioned as a site of destiny, where unlikely romances are just waiting to blossom. Note, too, Doyle's tacky Hawaiian shirt: he wears it for the film's first forty minutes, and it clashes monstrously with every other costume. It's emblazoned with images of the New York landmarks that Scorsese otherwise leaves out of the frame. There are a few concessions to reality¡ªthe thrumming Harlem Club seems to be an homage to the famed Cotton Club¡ªbut for the most part Scorsese plays commendably fast, loose, and poetic with setting; it's a New York of artistic feeling rather than devoted verisimilitude. The lavish, thrilling musical sequences featuring Minnelli are left until after the two-hour mark, which feels like a deliberate act of delayed audience gratification on Scorsese's behalf. (The extended "Happy Endings" number was in fact cut after the film disappointed at the box office upon original release.) 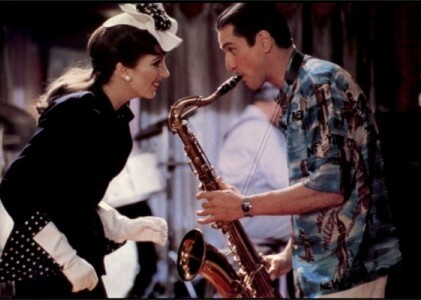 New York, New York culminates with a large-scale rendition of its title song by John Kander and Fred Ebb, which is written (in the film) by Doyle, and performed with rousing gusto by Evans in the same club where the pair first met. The repetition of this location suggests a sort of mythical circularity to go with the intractable pull of New York as a hive of creativity, and chimes with the theme of another Kander and Ebb song sung in the film by Minnelli, "And the World Goes 'Round." Minnelli's towering performance of "New York, New York" gives Evans a final not of triumph ("If I can make it there, I'll make it anywhere! "), but a bittersweet one for Doyle. Finally, after the sound dies down, there's a moment of reflection: a doleful Doyle dawdles along a sidewalk, his romantic dreams thwarted. The New York behind him has seldom looked more fake, but the emotions have seldom felt more real¡ªas such, Scorsese's genre experiment is a triumph. The Wiz's New York is one of oneiric topographic unpredictability. The film's Oscar-nominated art direction is modeled on reality, but in effect represents a subconscious mapping of the city by someone¡ªlike Dorothy¡ªwho's never been outside her own quarters, and can only rely on a combination of screen iconography and tabloid rumors for her vision. The first location is the New York State Pavilion in Queens' Flushing Meadows Park, where munchkins embedded in neon murals come spookily to life; initially, they lurch forward like proto-Thriller cast members, but as they come into the light resemble something more benevolent. Dorothy and Toto then find Scarecrow (Michael Jackson, a year away from cementing his status as a solo star with Off the Wall) at a fetid, rubbish-strewn dump, and the two continue down the yellow brick road, past heaps of trash and human detritus. At this point, The Wiz serves up the first of two fantastical alternate New York skylines: a row of five towers modeled on the Chrysler building, which seem to be interconnected by a red rollercoaster. Once they cross the bridge, they pick up the Tin Man (Nipsey Russell, a sardonic hoot) at the Coney Island Cyclone. (Incidentally, and presciently, the amusement park around it is said by the Tin Man to have closed down). Next, they pick up the Cowardly Lion (a larger-than-life Ted Ross) who bursts forth from a stone lion at a giant replica of the New York Public Library (Coney to Midtown in a matter of moments!). They are then menaced by inanimate objects in the disused Hoyt-Schermerhorn subway station¡ªwhich viewers may also recognize from The Taking of Pelham One Two Three (1974) and The Warriors (1979)¡ªand drugged with sparkling poppy dust by a group of hot-stepping hookers in a side street off Times Square's 8th Ave. When the gang awakes, they glimpse the Emerald City of Lower Manhattan, our second reimagined skyline, and ease across the Brooklyn Bridge to witness a huge dance number. 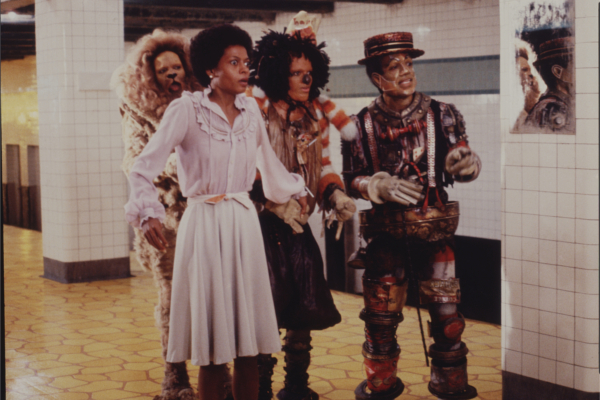 Here, The Wiz (a sweaty Richard Pryor in the film's most disturbing performance) sends them off to kill the Wicked Witch of the West, who runs a sweatshop in the sewer system. A biker gang chases them through Shea Stadium, but they escape and defeat the witch. 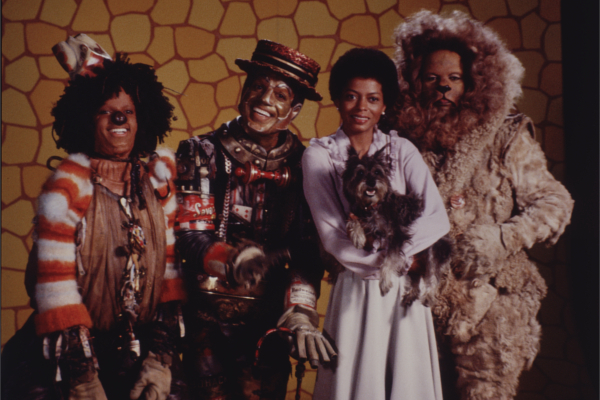 Cleaving to its source material, The Wiz is an epic of "be yourself!" self-actualization, but concludes in a curiously conservative way, with Dorothy safely ensconced back in Harlem. As the credits roll, we're left to wonder: after this kind of hallucinatory ordeal, could you blame Dorothy if she never, ever wanted to leave her house again? The film relies on landmark New York locations to frame some of its key musical sequences, but perhaps unsurprisingly, Lumet handles these with less stylistic dynamism than Scorsese. His approach mostly rests on a utilitarian blend of high-angle master shots, mid-shots, and close-ups, with little obvious camera movement. Yet thanks to the lively dance choreography by veteran Louis Johnson, Tony Walton's imaginative production design, and the energy of the performers, there is always something onscreen to catch the eye. The grandest of the set pieces is the spectacular shindig at Emerald City, situated in the eight-square block plaza behind the World Trade Center. The set required twenty-two playback speakers embedded into various props, so that the 400 dancers, standing hundreds of yards apart, could hear the sound cues at the same time. The scene¡ªwhich plays out in the shadow of the now-departed Twin Towers¡ªcarries a poignant extra-textual charge today.